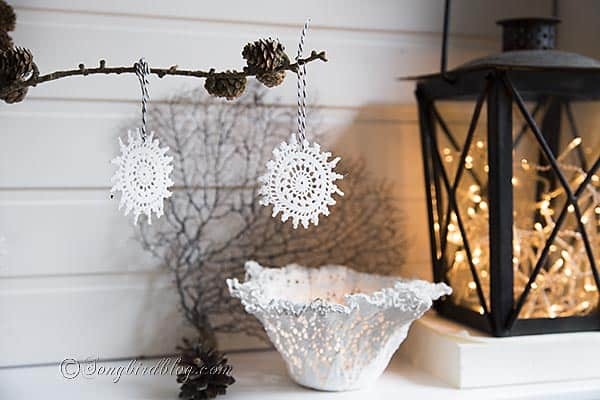 Today’s project is so easy, I could almost say it is too easy…..
Let me show you the world’s easiest way to create crochet ornaments: by using old doilies or crochet runners. 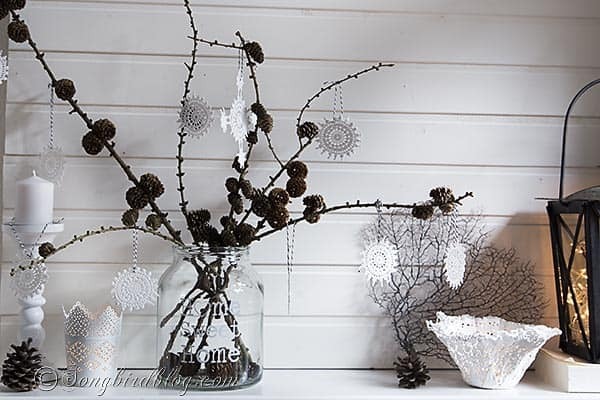 This is the ultimate repurpose of Flea Market Finds: cut them up and use them for Christmas. Speaking of repurpose ‘stuff’ to use in your Christmas decorating. Day 2 of the 12 Day series is a very special day. We are joining up with some of the best junkers in blogland: Junkers United. These ladies know their ‘junk’ you will be amazed what they will be sharing today. Just look at some of the awesomeness they have created in the past. The Junkers United gang have also created a beautiful new Christmas Junk pin board on Pinterest that you’ll love! Click the image to check it out. Okay, back to my too easy project of the day. My crochet ornaments that remind me of snowflakes, because, you know, they are white, and airy and seem to float in the air. I was ready to use them as the prop in yet another photo shoot, when I realized just how good they looked and that I never really shared them with you. So I decided to put the spotlight on them once and for all and show you how to make them…. I’d show you the steps…. If there were any steps worth showing…..
Buy a crochet runner at the flea market or thrift store. One with a circle pattern. Cut the circles out of the runner. Dunk the circles in a mixture of half water, half dissolved sugar. Let dry; let dry so long until no longer sticky. Told you this was easy…. If you can find really small doilies you can do it with those too, like I did here and here. And don’t forget to visit the Junkers too! Oh, that’s a great idea! So very pretty, especially coupled with the brown of the pine cones. I love them! What a great idea Marianne! I have many crochet doilies stashed away in a box that both mine and my husband’s grandmother’s made – this would definitely bring them back to life again. Thanks for the inspiration! The PERFECT upcycle, Marianne! I so adore these! And I thought you had to have some special solution to make the doilies stiff! Goodness… I could do this right now! Awesome! Marianne, this is gorgeous! Like a winter wonderland. Love how simple and easy it is, too! Great idea, and easy to do! It looks really nice with the dark foliage. What a clever little craft! And I love that they look like snowflakes. Too cute. These are so sweet and lovely–making some today! Your eye for elegance is unmatched. I bought doilies off etsy to glue to a lampshade for a winter theme look and now the forecast is for snow on Saturday!! It has not snowed since the ’90s where I live!!! They say just little flurries but still it might snow!!! I won’t use all that came in my purchased array of sizes of doilies so dare I sugar them?!! Do they melt?? Get sticky?? If they do I’d just start over!!! I think they look marvelous and once again, I’m inspired!! !